Junior biological sciences major Maria Chen co-founded Symbiont Health, which placed first in UMD’s 2018 Do Good Challenge. 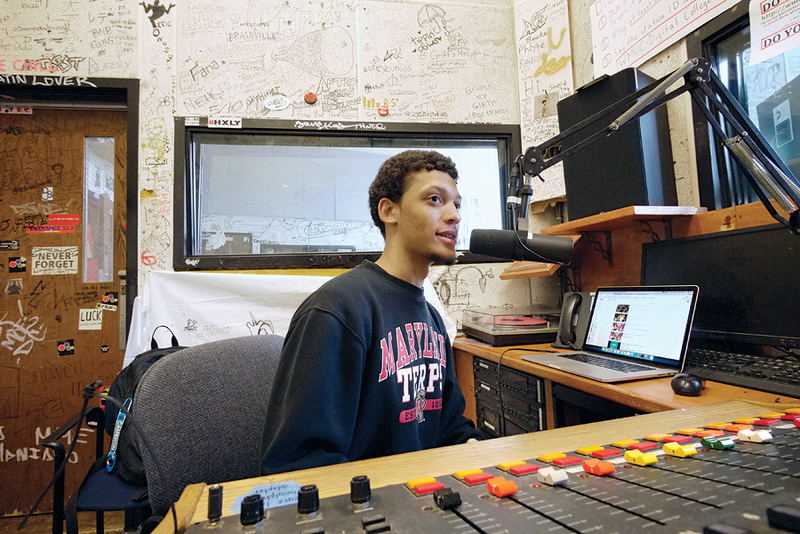 On Sundays at 5 p.m. you can find University of Maryland computer science major Cameron Payton inside the WMUC radio studio on the top floor of the South Campus Dining Hall. There, he co-hosts the hip-hop and underground music show “In the Creases” alongside Jordan Weber, a UMD criminal justice and criminology major. Last year, Payton and Weber had the opportunity to interview musician and Prince George’s County native Jay IDK (the stage name of Jason Mills) on their show. Outside the studio, Payton enjoys working with the university’s Black Student Union (BSU) and coding. “Both music and programming are extremely creative activities,” he said. Earlier this year at UMD’s annual spring Bitcamp hackathon, Payton challenged himself to work on an augmented reality project. With four Terp teammates, Payton built an augmented reality pong game where human players’ bodies served as virtual “paddles.” The project won an award for most creative user interface/user experience. But for Payton, the best prize was catching the attention of alumnus Brendan Iribe, co-founder of the virtual reality company Oculus VR and lead donor for the new facility for computer science and innovation that bears his name and is under construction on campus. “Brendan came over to play our game and asked how it worked. We were all amazed,” Payton said. During the fall 2017 semester, Payton is working as a teaching assistant for CMSC 389O: “The Coding Interview.” The class prepares students for coding interviews in which job applicants write or analyze code without a computer. When he graduates, Payton may pursue a career in web development, which he hopes would enable him to bring the power of internet technology to as many people as possible. But he is open to other opportunities. For instance, he did not expect to join the BSU or serve as the organization’s freshman council president, presidential cabinet member or vice president of administrative affairs. Such an issue arose recently on campus, when a white UMD student was arrested and charged with killing 2nd Lt. Richard Collins III, a black Bowie State University student. UMD’s Black Student Union issued a statement asking campus leadership to act against hate speech.